Last fall, two graduate students at the University of Texas at Austin, joined forces for their theses. 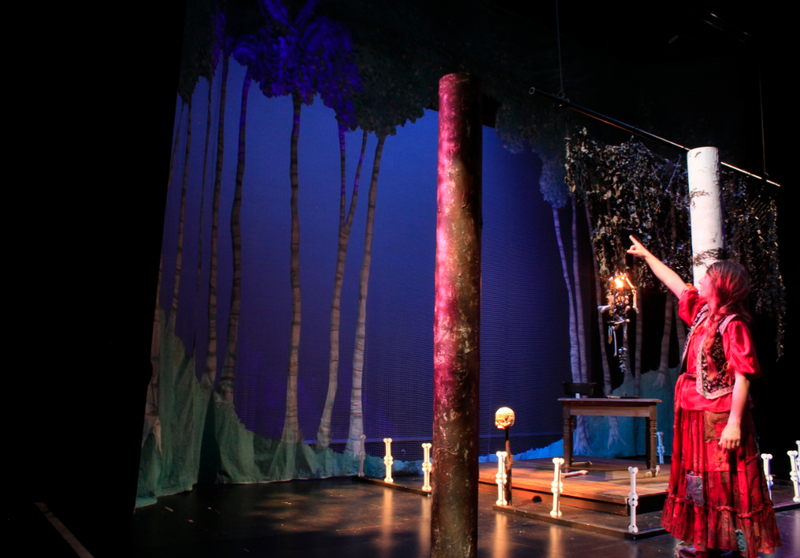 Rachel Alulis, a Lighting Design MFA candidate, and Meredyth Pederson, a Drama and Theatre for Youth and Communities MFA candidate, collaborated to produce the fairytale Vasilisa and Baba Yaga. They invited Becca Emmerich into the process as storyteller. Several months after the production, Rachel, Meredyth and Becca sat down with wine, chocolate and Meredyth’s dog to talk about what made this project unique. What made this process “non-traditional”? Meredyth: The kids- we involved young people. We partnered with a classroom of first graders, who acted as dramaturgs, advisors, and co-collaborators. Also no one was assigned the role as director, we shared the responsibilities. Rachel coordinated design and I served as dramaturg and did the staging. What about the product? What made our show “non-traditional”? Becca: The structure. Our show traveled through the theatre. We started in a small house built in the corner of the theatre, then traveled through a forest center stage, and moved into two more “houses” during the show. The audience moved with us. And there were moments of interaction. 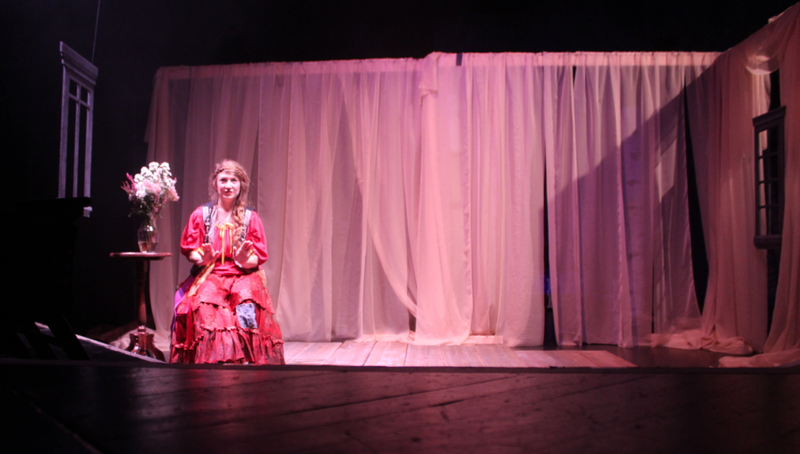 The audience built soundscapes during the show and were invited to ask the character, Baba Yaga, questions. Rachel: We also had only one actor. Becca was our storyteller, who acted as a guide/narrator and played the characters. Why this story? How did you choose Baba Yaga? Rachel: I’ve always loved Baba Yaga, it’s scary without being overly frightening. It’s a traditional boogeyman story, but there’s something just a little bit different. My dad loves Dostoevsky, so I grew up with Russia- birch tree paintings all over the apartment, so it was really familiar. Vasilisa is also a heroine who doesn’t need saving. She works hard, she’s caring, and she uses those virtues to save herself. We told the story honestly, and it’s interesting for adults, too. Even though the show was for young people, we kept the plot point of burning down the stepfamily, and we didn’t apologize for it. Becca: And that’s really juicy to think about. Who is this thing in the woods, who eats people, but sort of, almost rescues this girl? Meredyth: The audience always had questions for Baba Yaga: they wanted to know why she ate people. It’s fun to be afraid and instead of shying away, we leaned into the scary. Becca: I remember that girl asked, “What’s your favorite part of a human being to eat?” and I said, the toes because I thought, “Oh that’s funny.” But the girl said, “Oh, I thought you would have said the heart because it’s the juiciest.” That answer might make adults nervous, but this girl didn’t want funny, she wanted real and scary and honest. They love that honesty and that scariness. What were some of the ways through design and storytelling that we leaned into the scary factor? What were our boundaries? Rachel: I started with the image of moving through a haunted house. I don’t think that I considered the boundaries of scary for the audience because haunted houses scare me so much that I can’t imagine creating anything that would really scare people. Becca: I think, from my perspective as the storyteller, being so physically close to the audience helped me figure that out. Because I transformed into different characters by using my voice and posture, it was important for me to greet the audience as they arrived, especially the kids who looked a little scared. When we got to the scary parts, hopefully I had built trust with them. They were along for the ride; I was taking care of them. Also, their parents weren’t far away. I’m thinking of that little boy who kept coming close to the stage and then going back to his mom’s lap. Moving around the set so much gave them permission to move around in the audience, too. Meredyth: That boy was self-regulating his participation and proximity too. I think the movement of the piece made that okay. Becca: The questions from the audience also gave a sense of control. If you’re asking the questions, then it’s fun to hear the answers. Meredyth: The audience got to decide. No one had to ask a question, but if they did, they got to choose what to ask. The questions made us, as adults, look at our assumptions about what we think young people can handle verses what they actually are capable of. A lot of non-traditional theatre takes performance out of the theatre space, but we were in a theatre, using the space in a different way. Rachel: Using the theatre in this non-traditional way allowed us to cut our labor down significantly, but still have a show that traveled. Also, we had audience seating as an option for parents or kids who wanted a little distance or didn’t want to sit on the floor. 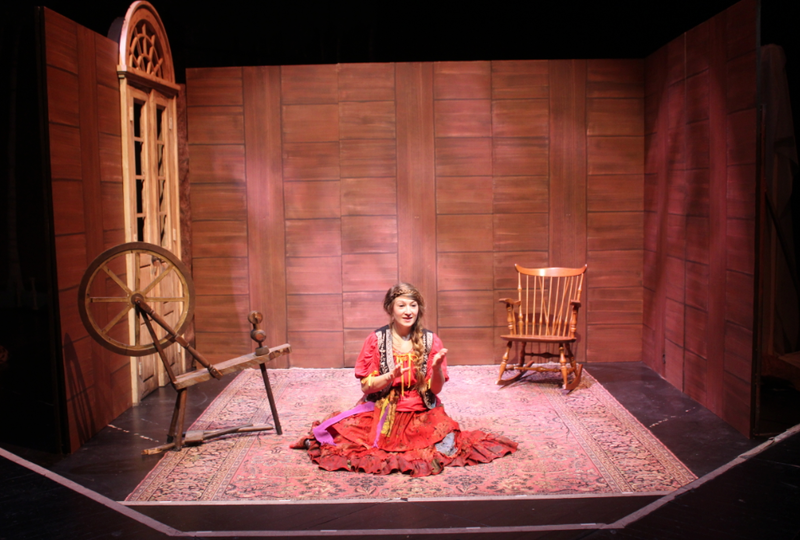 Meredyth: When you go to the theatre, you might expect to sit watch, listen, or see a story. But our audiences got to move and physically share space with an actor. It was an added element of surprise. Becca: Before we made the first move with the audience, when we opened the door to reveal the forest, there was a gasp from the audience. They were being invited into the world of the play. Meredyth: When they entered the theatre, they could see the whole stage. They could see the forest outside the window of the first location. It was clear that we were not using the full stage in that first scene. If you think about it, that shouldn’t have been a surprise, but I’m so glad that it was. Rachel: Controlling their vision was really important in this space. You always control the audience’s vision, but there’s something a little bit more concrete about saying you can only enter through this door and you have to stay in this one section of the theatre. Becca: Often you have a show with multiple locations where the scene literally changes. 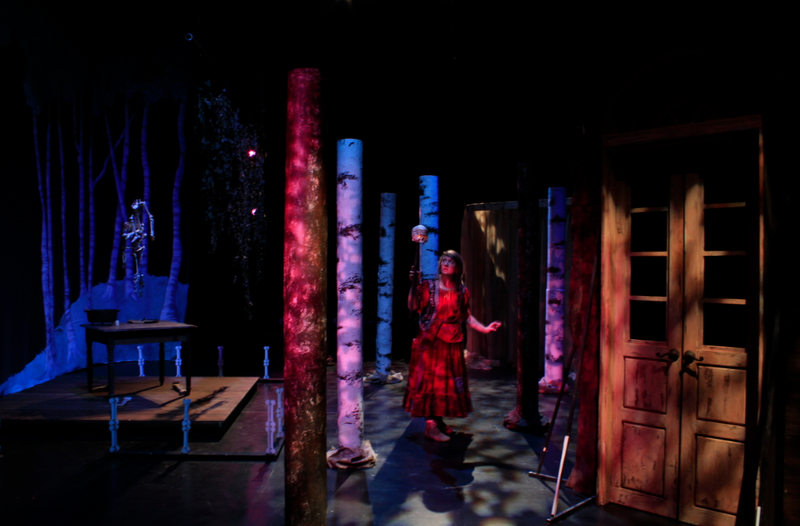 The play was in a forest, and then you’re in a house, but where did that forest go? The audience can’t see it anymore. In our show, the audience could track that we were in that house, we were in that forest, now we’re in this creepy shack, and then see another place that we haven’t been to yet. It’s tracking the story and foreshadowing too. Meredyth: This process brought up new things for me about design that I learned from you, Rachel. For example, we have to paint the back of the flats in the house because they will see them when they go through that door. I never thought about that before, but through the course of the play, they will see that house from 360 degrees, that’s important to think about. Becca: Moving through the environment was like having another scene partner, someone there to help you out. The design helped to tell the story and that was really brilliant. It worked. What about our audience? How did we consider the way they would interact with the world? Rachel: We invited them into the world. The audience could walk around the space, you were utterly immersed in the story. You were invited to touch things. Though the audience wasn’t really comfortable doing that until after the story, but they were invited from the very beginning. Rachel: …and they were so respectful of it. Afterwards, when they were jumping around the fence, they were so careful not to hit the bones [which were delicately laser-cut]. You can trust kids to be gentle. Becca: Because they part of that world during the play. Meredyth: The traveling nature of the show meant we had to do a lot of guessing about audience size. We estimated we could have 50 people. What does 50 people look like? Rachel: It wasn’t so much size as age. Friday was smaller, but it was also older. There were maybe 4 kids, so the adults felt free to walk through the forest too, whereas the other two nights it was bigger, but it was a younger audience, so most of the adults just sat back. They didn’t want to move. Because of that, it was helpful to have one of us on the floor to hold the door or coax them. Meredyth: There was one audience where we had a lot of kids and a lot of adults. It was a large house, and we had that initial invitation into the forest and they still went around the wall instead of through the door! That was an interesting moment of, “Yes, that is more efficient, my adult practical brain, I’m totally with you, but isn’t it more fun to walk through the door!? !” I know it takes longer. That was something that we couldn’t really prep for in rehearsal, because we had two people max watching. It’s totally different when you’re moving 30 bodies through the space. Just the duration of time it takes to move through a single door. Becca: I loved that big audience, even though they were cheaters. It was really cool being in the forest with them. I’m not very tall, so the audience added to the trees. I was weaving in and out of not just the trees in our set, but peaking out behind people and trying to look over grown-ups to talk to the kids. It was a really cool moment- the audience became a part of the world and the set. Meredyth: It’s about closeness, bringing actor and audience close together, bringing actor and scenery/design close together. Audience proximity to the set and each other. There’s a lot of closeness. I can’t say cause and effect, but it was mirrored in a lovely way in our process. Having designers in rehearsal that much, because you as the lighting designer were the generative artist. Having a designer at the helm of the project- of course design is going to be important and become another thing for the audience to interact with. Becca: Let’s do this show again! I am an artist whose instrument is light. Light is embroidery; it enhances the playwright’s language to help tell the story. I create worlds, emotional environments, and aim to enrich the audience’s experience as a whole. In my practice, I believe that conscientious criticism creates a space to further the elements of collaboration, communication, and kindness. I identify as both an educator and an eternal student. I strive to learn from and give back to my communities. My eyes are trained to seek and form aesthetic beauty in all creative structures. Color, shape, angle, form, texture, and time are tools I use to sculpt performers. As an organized, efficient, and focused individual, I find that a sense of humor and a discovery of joy in the creation of new stories are essential to my practice. I am a storyteller and a lover of language. I am an artist whose instrument is light. Meredyth Pederson is the Education Director at the Raleigh Little Theatre, NC. She is also Managing Editor of TYA Today. She holds an MFA in Drama and Theatre for Youth and Communities from UT Austin. Previously, Meredyth served as Associate Education Director at Lexington Children’s Theatre in Kentucky. Read her Teaching Artist blog at ArtSmart.